Why submit data to the CCRCN? 1. It will increase the likelihood that your data will be included in future syntheses. This means more citations, more collaborations, and more publicity of your work. 2. The CCRCN is nested under the Smithsonian, a trusted institution with a legacy of long-term archival. The Smithsonian has a long history of archiving physical and digital content, as well as high visibility and recognition. 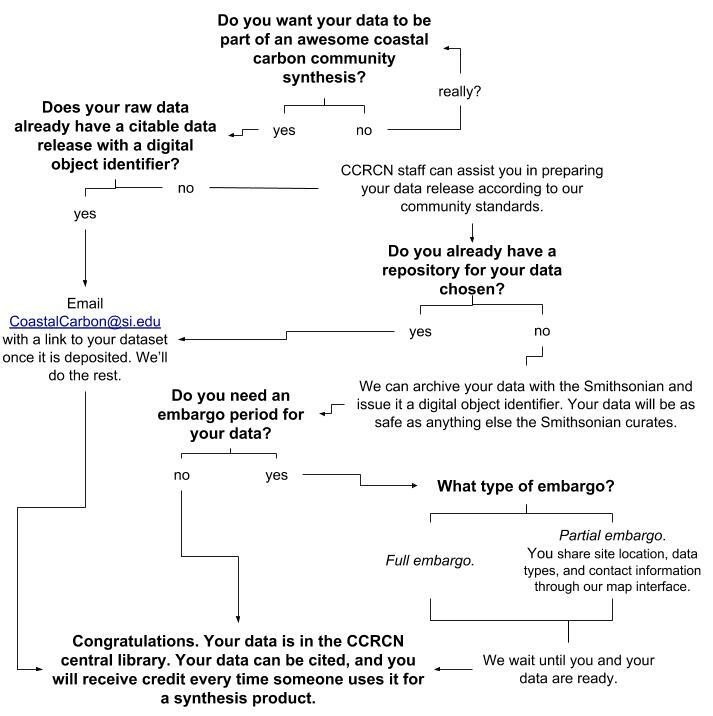 Submitting data to the CCRCN will enable you to release your dataset as a distinct DOI, which can be embargoed and versioned, and is stored under one of the Smithsonian Library's digital repositories. 3. Our data clearinghouse is targeted to the coastal carbon community and receptive to feedback. Because our focus is specialized, as opposed to a more general data repository, our vocabulary and structure is catered to those engaged in coastal carbon science, and we have the capability to quickly respond to new developments and recommendations through our version-controlled data structure. 4. We have full-time staff dedicated to assisting the data carpentry and archival process. Our staff are happy to assist the process of reformatting data and providing the affiliated licensing and DOI for your data release. Interested in contributing data to the CCRCN? If so, please email CoastalCarbon@si.edu and CCRCN personnel will assist you in the process. We are working on building a webportal to automate a lot of this exchange, but until we do so this will remain a very friendly peer-to-peer handoff system. Data submissions can remain embargoed for a time specified by the submitter. In embargo cases a data release will be prepared and shared with the submitter via a private dropbox link, until the embargo period ends, the data release is made public, and the dataset is drawn into synthesis products. Please use our Data Submission templates, which can then be emailed to CoastalCarbon@si.edu.